Two more outfits I wore for the Winter Style File style challenge. It's nice that the winter weather has arrived and I can wear my ankle boots again! 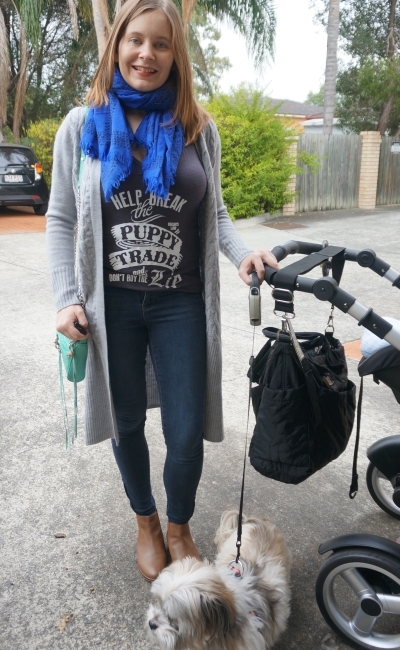 My prima denim skinny jeans, Chelsea leather ankle boots, tees and cosy cardis make easy SAHM winter outfits! The style challenge for the day was 'put a scarf on it'. Easy to do with the cold weather making me want to layer! I thought this was going to be a quiet and relaxing day, but after getting home in the morning and settling down to feed baby boy I checked my phone as I knew I had a doctor's appointment coming up that week. Only to find that my appointment was in 15 minutes! Thankfully the traffic lights were in my favour and we were only 5 minutes late for my appointment, and as the doctor was running a little late I was able to sit there in the waiting room and feed the now very cranky baby boy. Last worn: grey cardigan, cobalt scarf, graphic tee, Prima skinny jeans, Chelsea boots, Rebecca Minkoff mini MAC. Other ways to wear: wool cardigan and a skirt, cobalt scarf and stripes, graphic tee and a maxi skirt, skinny jeans and a kimono, Chelsea boots and a chambray dress, Rebecca Minkoff mini MAC and floral print. 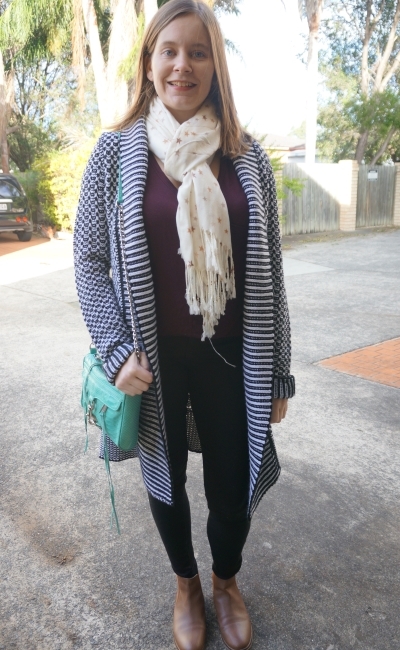 Another cosy cardi, skinny jeans, ankle boots and scarf outfit! Needed something simple as we had to stop by the shops on our way to playgroup that morning and I was in a bit of a rush. While the tan ankle boots don't look too bad I think black ones would have been better. The style challenge for the day was to wear your favourite coat. I wore this a lot last winter, although this was it's first wearing this year. It's a "coatigan" which is a word that makes me giggle ever since I first heard it. A cosy cardi that's thick and warm enough to be a coat! It came in helpful as it was such a windy day. Last worn: black and white cardigan, star print scarf, maroon tee, black prima skinny jeans, Chelsea ankle boots (above), Rebecca Minkoff mini MAC (above). Other ways to wear: black and white cardigan and a maxi skirt, star print scarf and floral tank, maroon tee and metallic gold jeans, black prima skinny jeans and a printed cami, Chelsea ankle boots and a blue dress, aquamarine mini MAC bag and red jeans. Linking up with Weekend Wear, Flashback Friday, Passion for Fashion, Fab Favourites, The Ultimate Rabbit Hole, Shoe & Tell, Let It Shine. That has totally happened to me: Oh, I need to be at the doctors in.... WHAT? I think baby brain continues after pregnancy...haha! love those skinny jeans and that blue scarf in the first outfit...you look great! The second outfit is very chic...and that striped cardi really caught my eye! Come join this GIVEAWAY I am hosting at the blog for yoga/activewear brand AIRABELLA ACTIVE till July 3 - Have a great weekend! Wishing I had your bag collection! The second long cardigan looks so cool and comfy! 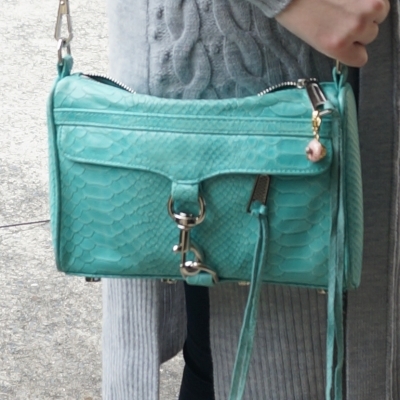 The littl cross body bags must be extremely handy when you have to carry so much with two babies :) I like how you always pair colourful accessories with your casual outfits! It's always nice to have a couple of coats that you can style over and over again for years to come. What a warm looking coat! You have such lovely cardigans, girlie! I need to get some like these for the fall this year, they look so thick, cute, and comfy! I love the shirt in look #2, so cute! Thanks so much for sharing and I hope you have a wonderful weekend ahead, beauty! I have OTK boots and normal height boots but no ankle boots. I use to have one pair but I find it to look funny on me and I gave it away. I adore that stripe cardigan in the second outfit, actually I'm a huge fan of stripe anything! Oh that doctors appointment scenario is my worst nightmare, and I don't even have a baby to worry about! Glad it all worked out in the end. 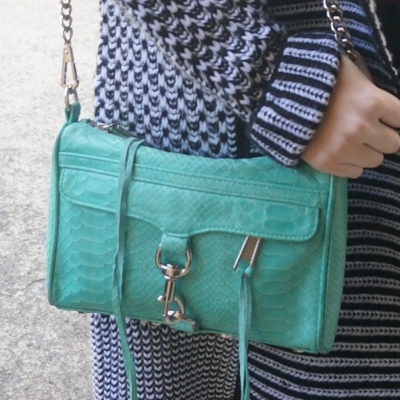 That bag is so pretty, and it seems to go with everything! Yes I'm so glad we made it in the end, gaah! haha. Happens to us all at one time I think. I love that coatigan - what a great idea! I'm desperate for some tan boots - yours look fab! I heard it's officially winter in Australia... I wish Chicago winters looked "as good." Lol!! Hey, mama, give yourself a break for almost missing an appointment. You have a new little one to keep you plenty busy. Glad you both made it in time and hope you two are well!! haha yes we are lucky it doesn't get too cold here, no snow in Brisbane! You look great in both outfits:) I've been meaning to knit a long cardigan but just haven't found the time. After seeing yours, it's more of an incentive now! And LOL on your doctor's appt. :D That's happened to me more times than I care to remember. Ah, what is worse than realized you've totally forgotten about an appointment and having to rush around to make it! but I'm glad it worked out and you were too late and too stressed. Love your long chunky cardigan - it looks so cozy. I can imagine how stressed out I would be for a minute haha. haha yes I gt a fright when I realised! I love a good cardi, especially a long one.. even in summer (since it's summer over here right now =P). Love how you styled them and loving the stripes in that second outfit! I have a lighter one I can wear in warmer weather, just a bit too chilly for it right now! Love your coatigan! And scarves are so much fun - such a great way to change up an outfit! Now I'm looking forward to winter over here ;) I love long cardigans like this! And ankle boots are always a must for the cold season. The long cardigans look perfect for so many occasions. I think I could do with a couple. I love those long sweaters! They all look so cozy & warm :D Look great on you Mica. Love the scarves with them. As much as I love the sun, it's so cosy to bundle up in scarfs and cardi's just as you've done here! There's something really lovely about layering up! What a fun, casual style! Coatigan is a funny word ;) Your's looks very chic and cozy at the same time and I can see how it would be a very versatile piece for you. Great job on the challenge Mica! I love the comfy, long cardigan style! I always wonder how winters in australia is like; my cousins live there and it's so strange when we meet up in Hong Kong in December and they just came from summer and I come from winter! Ooh I love that cardigan in your second look--it looks so warm and comfy!! Good thing you checked your phone when you did and made it to your appointment--that's so frustrating when you think something is later in the week when it is. Yes I'm lucky I checked or I would have forgotten entirely! Love the ankle booties! You are making me wish the weather was cooler so I could take out all my layers!